Mixed Salad Annie: What's Grilling? For those of you who do not like fruits or vegetables... You don't know what your missing. I love fresh fruit and veggies and eat both everyday. If you've never tried grilling these natural wonders, there is no better time to get going. Pick fruits and vegetables that are in season for the freshest tasting experience. Grilling brings out the natural sugars in the fruit as well as in the veggies and gives a great caramelized flavor. Dress them simply so that their natural sweet flavors shine through. The next two recipes were inspired by Giada DiLaurentiis and they are both delicioius! Heat an indoor grill pan or outdoor grill on medium high heat. Grill the pineapple slices 3 minutes per side or until you see golden grill marks on the bottoms. Heat the chocolate-hazelnut spread in a small bowl in the microwave for about 30 seconds until melted; stir to see if it is ready to drizzle. Heat 30 seconds longer if needed. Place the grilled pineapple slices on a large serving plate and drizzle the chocolate spread over the top. Sprinkle with nuts and serve. Heat an indoor grill pan or outdoor grill on medium high heat. In a large baking dish add olive oil and salt and pepper. Add the zucchini and toss to coat. Place 1/2 of the zucchini on the grill. Add the onions to the dish and carefully toss to coat with oil. Add them to the grill. Cook for about 3 to 4 minutes per side or until the vegetables are tender and show golden grill marks on the bottoms. Grill the remaining zucchini. Arrange the zucchini on a platter and top with onion slices. In the same baking dish whisk the 2 tablespoons balsamic vinegar, salt and pepper, parsley, basil, and thyme until blended. Drizzle the over the top of the vegetables. Can be served warm or at room temperature. 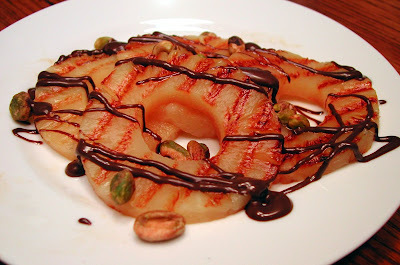 I love grilled pineapple, and I can only imagine how great it would be with chocolate and nuts! 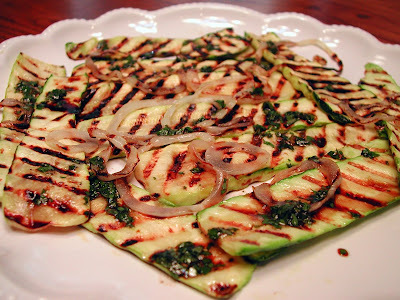 And the grilled zucchini and onions look delicious. Since I'm more of a savoury kind that grilled zucchini is right up my alley. I'd finish eating it in no time. I love grilled veggies and fruit and your recipes sound fabulous! Bambola, I'm a veggie nut too. I guess the apple doesn't fall far from the tree! Sara, thanks and yes the pineapple just gets even better with a drizzle of chocolate, especially when it's Nutella! Lore, Thanks for visiting. If you like savory then the zucchini is for you!! Lisa, I guess it's hard not to love anything from the grill, isn't it? Yum yum yum. I've got to try grilling fruit.